Dr. James M. Lind, Adjunct Faculty of the Year, is joining OJC full time as music faculty; however, for the past two years he has been a music adjunct instructor with OJC. Dr. Lind has a plethora of music experience. In his new role he will work to develop a music program and teaching classes in music theory, ear training, music history, and music appreciation. He is married with one daughter. In his free time, he enjoys performing music in all genres and settings, traveling, hiking, reading, watching sports, baseball and football, and relaxing with family. He hopes to develop a top notch music program in southern Colorado where students are encouraged in a creative environment. He wants each of his students to leave OJC prepared to face challenges in tomorrow’s world. 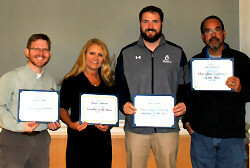 Otero Junior College announced the Employees of the Year at its All Staff meeting held on Jan. 11. Pictured are OJC’s Employees of the Year (l-r) Dr. James Lind, Adjunct Faculty of the Year; Angela Tarrant, Faculty of the Year; Chris Smith, Professional – Technical Employee of the Year, and Joe Talmich, Classified Employee of the Year.